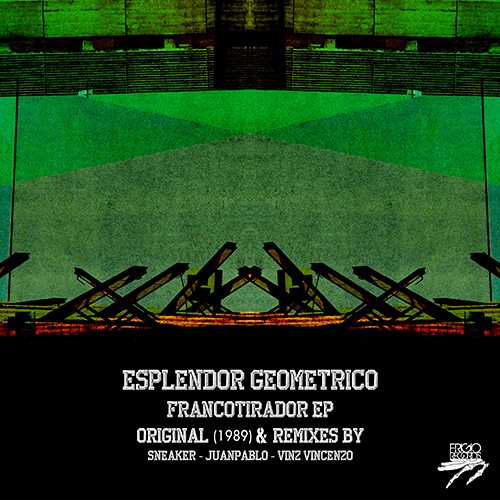 Our Beat Is Still New /w Red D.
Frigio is very honored to release the biggest and most important Spanish electronic project of all times “Esplendor Geometrico”. So am I to remix them. From the early 80´s until today, they´ve been delivering the most authentic, raw and powerful industrial electronics you can hear. “Francotirador” which means “Sniper” is a track recorded back in 1989 and this record includes original plus 3 remixes by Sneaker (who previously did a remix for Twilight Ritual), Juanpablo (head of Frigio Records) and Spanish producer Vinz Vincenzo. “Francotirador” is pure analogue drums with a strong “tribal industrial” approach. demonic string-chords to male vocal staccatos, ravehits and back again, finding it’s point-of-no-return in a Sartre-like fulminant ending. flavor to this mixture that we guarantee will be very hard to describe as usual on Frigio Records.